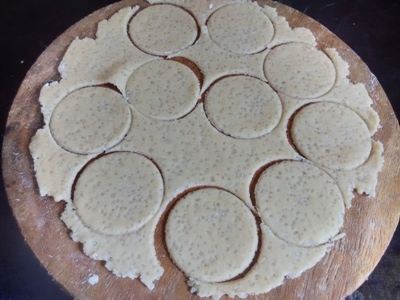 Thekua Recipe/Khajoor Recipe/Meethe Khastte Recipe. How to make Thekua Recipe/Khajur Recipe /Khajoor Recipe /Meethe Khaste Recipe with step by step picture. 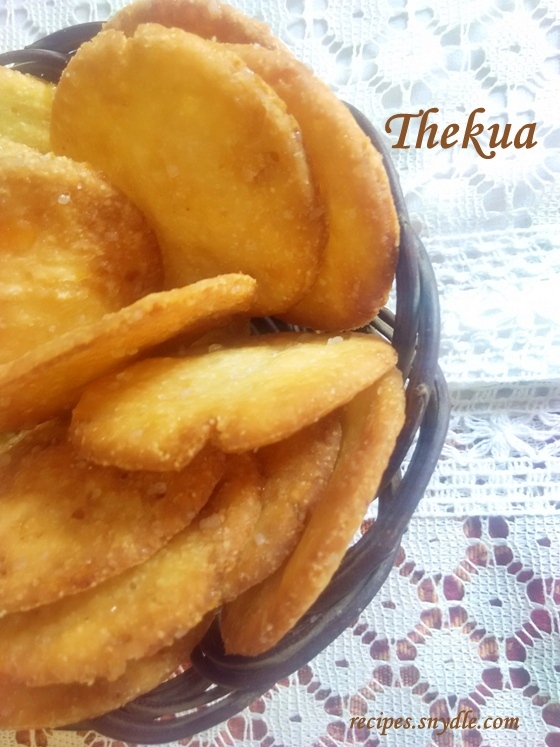 Thekua is homemade cookies or a sweet snack popular in north and east India. Thekuas are mostly made on karwa chott and chatt pooja. 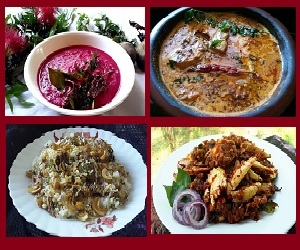 Thekua comes from bihar and Jharkhand gastronomy. 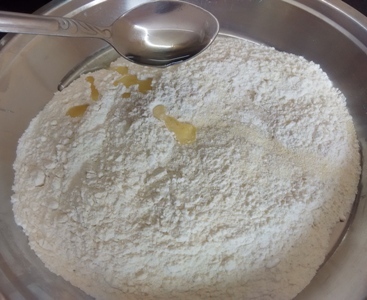 Thekua is an north Indian dessert. 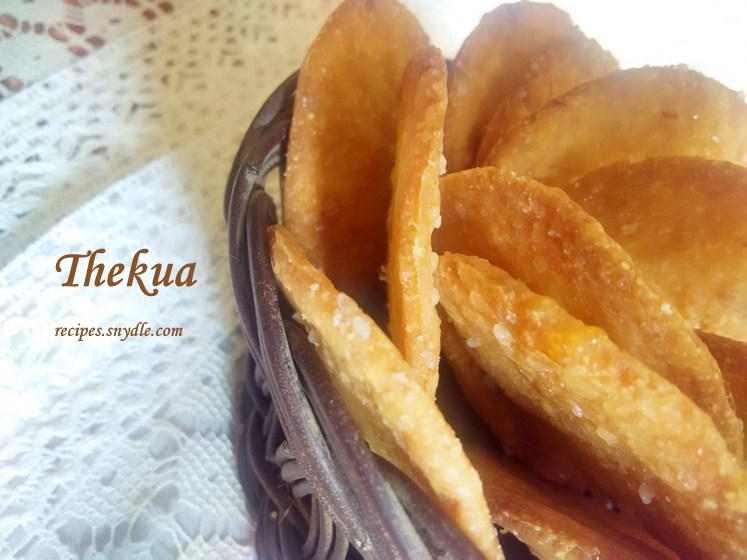 Thekua is a best tea time snacks. 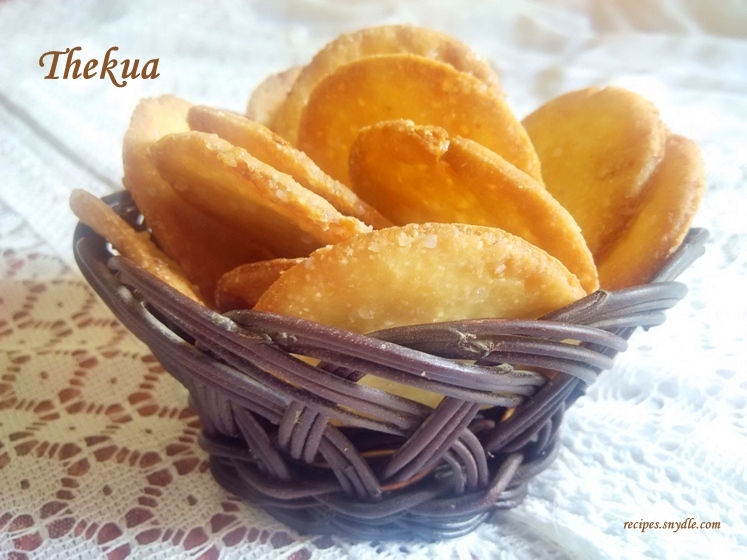 Scrumptious, crispy and crunchy cookies recipe that you can make at home. Here I am sharing thekua recipe with sugar. 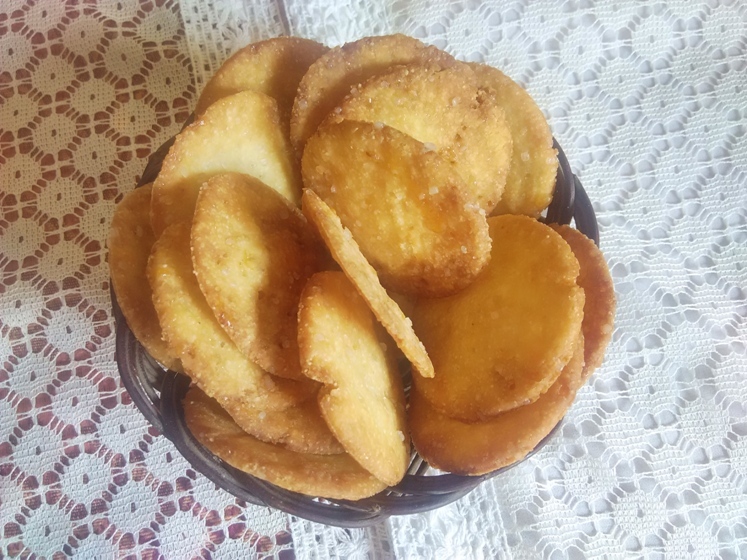 Here I have used normal sugar, you can use powdered sugar/icing sugar/pitti sakhar. 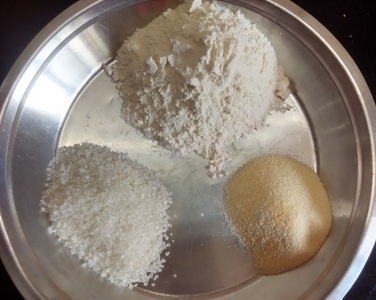 Be careful, if you are using powder sugar do not forget to prick the chappati with fork or else the cookies will puff like puri. But I suggest you to use normal sugar granules as it will provide crunch to the thekuas. Jaggery can also replace sugar. 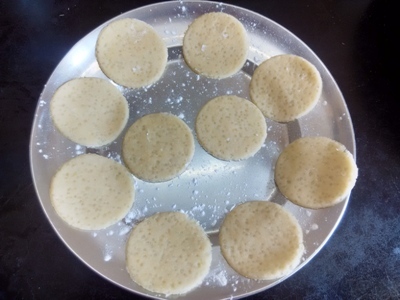 Thekua recipe with jaggery too tastes luscious. Thekuas has a good shelf life and can be stored in the air tight container for few weeks. It is an outstanding snack to be stored for your surprise guests. 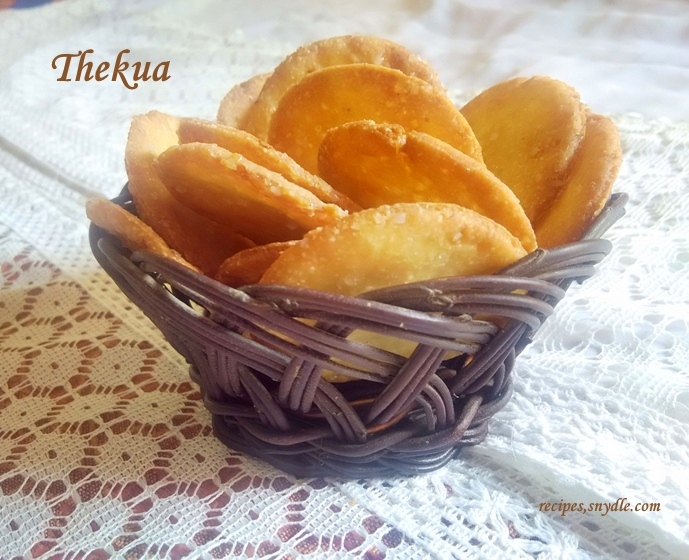 Thekuas is a desi snacks and gives a tasteful company while travelling. On the other hand relying on packed food stuff is not a good idea. You can also try thekua recipe baked. It’s a healthy version of thekuas. 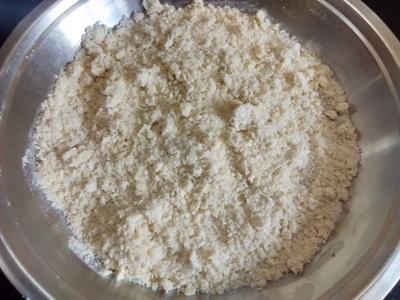 You can also add some more ingredients to the thekuas like cardamom powder and coconut powder. Milk – To make dough. How to make Thekua/Khajur/Khajoor /Meethe Khaste. 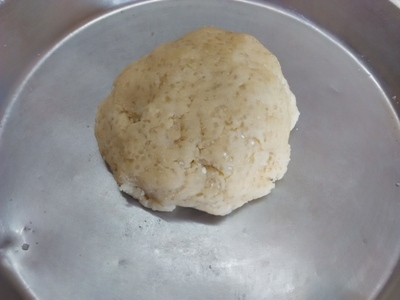 Mix rava/semolina, maida/refined flour and sugar in a plate. Add oil to the mixture. Mix the oil with mixture by your hand till the mixture gets crumbly. Make medium consistency dough. Dough must not be too stiff or too soft in consistency. Use milk for making dough or you can use water instead of milk. While making dough remember the sugar must be visible in the kneading process as it provides crunch to the cookies. Divide the dough into equal parts. 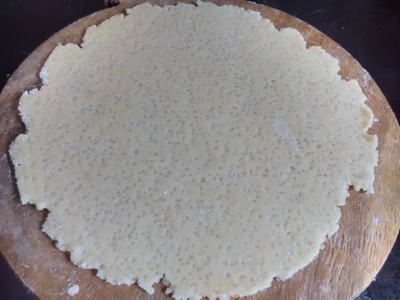 Place it on dusted board and roll it with the help of rolling pin in circle shape. Chapatti must be of medium consistency not too thick or too thin. Cut the thekua with the help of cutter in circle shape or the shape of your choice. 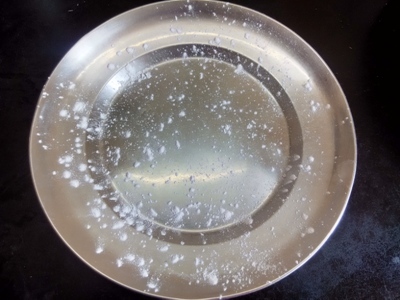 If you are using icing sugar/pitti sugar/powder sugar do not forget to prick the chapatti with the help of fork and then cut the thekuas with the help of cutter. Take a plate and dust some maida/refined flour on it. 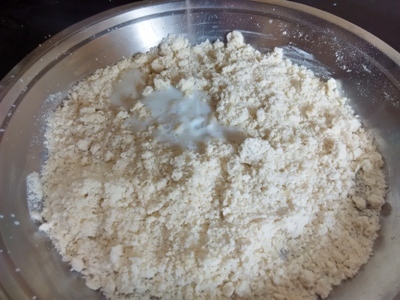 Dusting maida/refined flour on plate prevents the raw thickuas not to stick on the plate. Place the raw thickuas on the plate. When all the batches are complete. 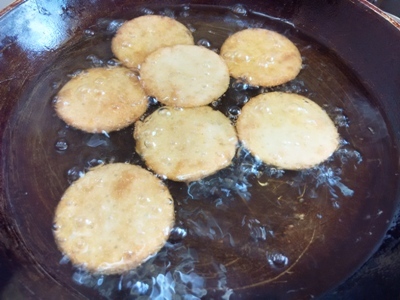 Heat oil in a skillet and place thickuas into it. Fry the thekuas on medium flame. Flip the thekuas and evenly fry on the other side. 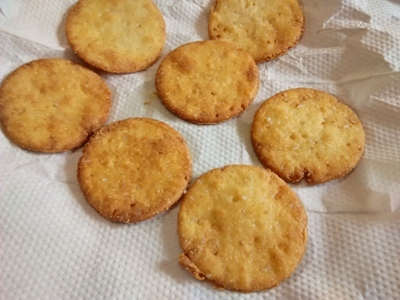 When the thekuas are evenly fried on both the side and got good golden brown colour. Remove the thekuas carefully on the kitchen towel to drain excess oil. 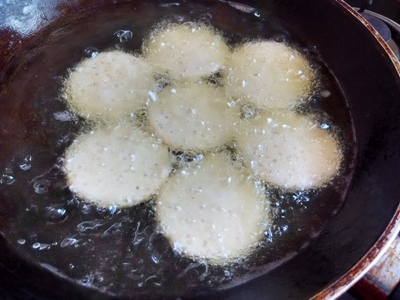 When you will be removing the thekuas from the skillet you will notice that the thekuas are very soft in nature. Perform this step with patience. As the thekuas cooling down they will slowly start turning crispy. Your homemade cookies / thekuas are ready to eat. Enjoy! Next Post: Palak Gosht Recipe/Spinach Meat Curry Recipe.